Why write about French ice cream? Well, just like American ice cream or even Japanese ice cream, the ice cream produced in France is unique to that country and its ice cream makers. Visit any local glacier (ice cream parlour) in France and you will discover very quickly that the French have a liking for a mixture of both regular and unusual flavors. Whenever I visit France I make a point of checking out just about every glacier I come across - much to the pleasure of my family! The glace vanille (vanilla ice cream) is delicious every time - made with real vanilla. 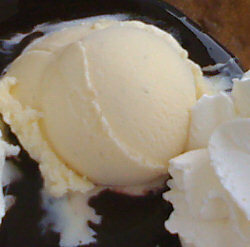 Look at the little black vanilla pod seeds in the vanilla ice cream photograph (left). How do the French enjoy their ice cream? From what I have seen, French people are just like everyone else in that the majority love an ice cream cone - what they call gauffres. Many French ice cream parlors give a free, small plastic spoon with the ice cream cones they serve and I noticed a lot of French people enjoy eating their cones this way. The French also enjoy their ice cream on crêpes (hot thin, sweet pancakes). The most popular I saw was a crêpe with a scoop of vanilla ice cream, some hot chocolate sauce and sweet, whipped cream (chantilly) as in the above photograph. As in all countries, you can find ice cream makers producing unusual ice cream - sometimes just for a special promotion but also sometimes because of the local delicacies on offer. This is the case with Japanese ice cream where seaweed ice cream is very popular, not a novelty by any means. 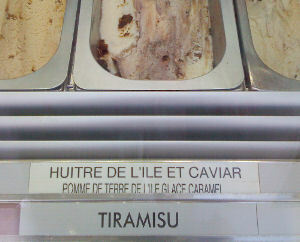 On my travels in France one of the most unusual ice creams I came across was oyster and caviar ice cream at a local glacier on the beautiful Île de Ré. Check out the label in the ice cream cabinet photographed. Sadly the only actual ice cream in shot is Tiramisu - you'll just have to take my word for it that the oyster and caviar ice cream was there! 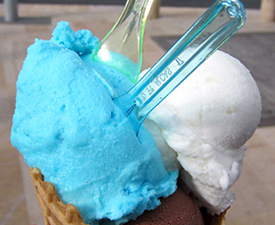 Another unusual ice cream I came across in France was blue ice cream, really popular with children. The flavor of the blue ice cream in the photograph was vanilla almond made by artisan glacier Jerome Paradis. I found that the art of ice cream making is as revered in France as it is in Italy. A master ice cream maker (master gelatiere in Italy) is known in France as artisan glacier (also maître artisan glacier). Jerome Paradis - artisan glacier with his own ice cream parlor "Le Paradis Glacier" in La Trance Sur Mer, Vendée, SW France. His chocolate ice cream has to be one of the best I've ever tasted! Gino Soldan - master gelatiere working in London. He has made Wensleydale cheese ice cream, Yorkshire Pudding ice cream and even Sausage & Mash ice cream!